In this review of Diabetes Meal Planning Made Easy published by Nutrition 411, Alex Lewis, RD, LD says "Anyone with diabetes, anyone who supports a loved one with diabetes, or any health professional who treats patients with diabetes will benefit from reading and utilizing this book as a go-to resource." 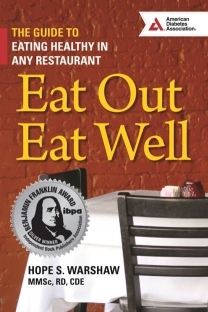 On Nutrition 411 Alex Lewis, RD, LD reviews Hope's book, Eat Out, Eat Well: The Guide to Healthy Eating in Any Restaurant. Wondering what has been changed, deleted or added on the new Nutrition Facts Label? Read Hope's TheDX story to get all the facts. Mornings, from the sound of that alarm to getting out the door, might sometimes feel like one continuous race. Does this time-strapped rush cause you to eat unhealthy foods for breakfast, or skip it altogether? Read Hope's blog on TheDX for some tips to make breakfast happen, along with ideas for quick-to-fix and tasty-to-eat breakfasts that may help keep blood glucose levels on an even keel. In this TheDx story Hope discusses the prevelance and costs of sedentary behavior. She dives into how much sitting is too much and how to reduce sedentary behavior. Hope provides realistic tips to combat this risk factor that can lead to developing prediabetes, type 2 diabetes and heart and blood vessel diseases. The Spring issue of Diabetic Living has an article by Hope that is a basic primer for persons with diabetes on what they should know about medicare in 2016. Hope covers overall changes, what's new in Parts A & B, Medicare Advantage (Part C) and the Prescription Drug Benefit (Part D). She also goes over how to make changes to your plan to get the best coverage.